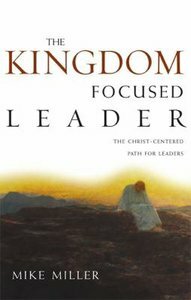 - Publisher The Kingdom-Focused Leader recognizes Jesus Christ as the consummate Leader of all time--as a Leader focused on the Kingdom of God in His earthly ministry, as the One who continues His leadership in guiding God's people to advance the Kingdom of God throughout the world. Miller explains how every leader can model Jesus' example of constant awareness that the Kingdom of God works in, through, and around all Christians. - Publisher Recognizing Jesus as the consummate leader of all time, this book explains how every leader can model Christ's example of constant awareness that the Kingdom of God works in our lives every day. The Kingdom-Focused Leader recognizes Jesus Christ as the consummate Leader of all time--as a Leader focused on the Kingdom of God in His earthly ministry, as the One who continues His leadership in guiding God's people to advance the Kingdom of God throughout the world. Miller explains how every leader can model Jesus' example of constant awareness that the Kingdom of God works in, through, and around all Christians. Recognizing Jesus as the consummate leader of all time, this book explains how every leader can model Christ's example of constant awareness that the Kingdom of God works in our lives every day. Michael D. Miller is the author of Honoring the Ministry and is coauthor of Kingdom Principles Growth Strategies. The director of Church Relations for Life Way Christian Resources, he is a graduate of Oklahoma Baptist University, Southwestern Baptist Theological Seminary, and The Talbot School of Theology. He resides in Nashville, Tennessee.